CHICAGO - Nothing is certain for Tim Wakefield at this point in the season, at this point in his career, at this point in the pain. He can barely walk around the clubhouse, with a limp that gets more and less noticeable, based on the day. There is constant discomfort, most obvious when the aging knuckleballer attempts to do anything short of stand and throw. And even that, even pitching, is excruciating for him at times. Still, Wakefield can throw. He did throw yesterday, surviving a shaky first to record six innings of work against the White Sox, though they all ended in futility in a 5-1 loss that was all about Gavin Floyd’s dominance at U.S. Cellular Field. But it is difficult for anyone to know, including Wakefield, when he will next pitch again, or whether he will pitch again. “It hurts to walk,’’ he said. “It’s basically managing the pain, getting through it, and being able to pitch. Asked for his confidence level on being able to go out and pitch next time, Wakefield said, “Right now? Good. 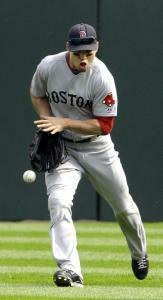 It was an infield hit, on which Kevin Youkilis rushed over to first but couldn’t beat Getz there. Wakefield ran over as well, having to avoid Youkilis at the last minute. Manager Terry Francona came out with a trainer to ensure that Wakefield was OK, and the pitcher remained out there long enough to get an out, ending the sixth. But it wasn’t Wakefield getting the pitching accolades by the end of the game. Floyd was busy making that 3-0 first-inning lead stand up, keeping the Red Sox off the bases over the first five innings. So as Green stepped to the plate, 15 games since his last start, there had been 17 up and 17 down, Floyd having cut a swath through the Sox. He had been, in a word, perfect. But then, two outs into the sixth, Green singled up the middle, marking the first time a Boston batter had reached base. In the third game of his major league career, Green’s Braves were dominated in Randy Johnson’s perfect game in 2004. “It’s one of those things, once you start thinking about that stuff, it’s hard to overcome,’’ Green said. The 33,239 in attendance gave Floyd a standing ovation. The single would hardly make a difference in the final tally, but it would in the legend of the day. No, the White Sox wouldn’t have two perfect games in a season. They would, however, deal the Red Sox another loss, their second straight in this series. The Rangers also lost, however, keeping the Red Sox’ lead in the wild-card race at two games. Other than that single, and a later double by Victor Martinez? There were a whole lot of swings and misses. The Red Sox got their run on a home run by Jason Bay, the left fielder taking the first pitch of the eighth inning out. Not long after that, on a swinging strikeout by Mike Lowell, Floyd would get his 10th K of the day, equaling his career high. Then pinch hitter Casey Kotchman became No. 11, marking the futility and frustration for the Sox, and ending the day for Floyd. Too well for the Red Sox, who are now in the position of having to win the final two games of this series for a split. That can easily be attributed, at least yesterday, to one person: Floyd. “Their guy was just dominant,’’ Francona said. “Slider, cutter, fastball, change, everything. He just kind of carved us up.